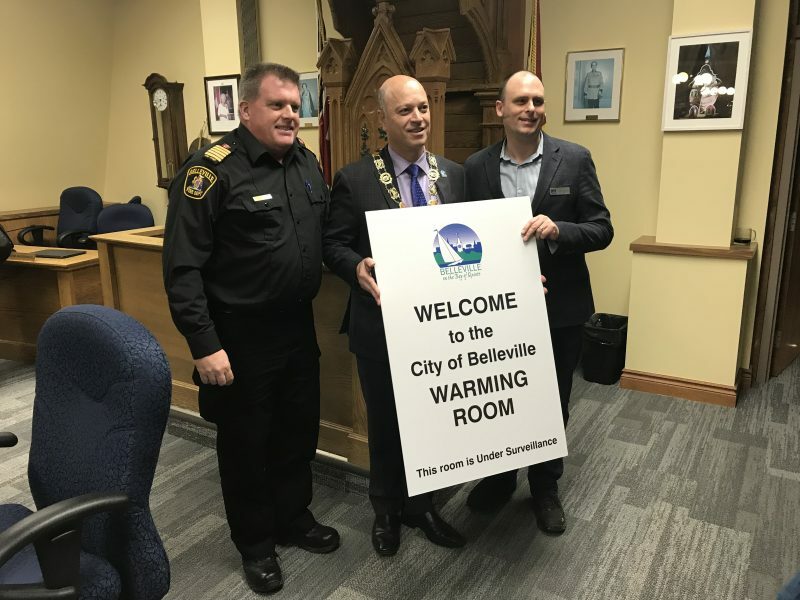 BELLEVILLE – A brand-new overnight warming centre for people without a place to sleep in the freezing weather has already been put to use. The centre, located in the front lobby of the Belleville Public Library, was approved at a city-council meeting Monday. It was then open from 8 p.m. Tuesday to 8 a.m. Wednesday – just as a major snowstorm hit Belleville, along with the rest of Ontario. Mayor Mitch Panciuk said the library was chosen due to its downtown location. “It was the most appropriate place that would be conveniently located in the downtown core, close to some of the other social-service locations,” Panciuk told QNet News after Monday’s council meeting. The lobby is ideal for security, as it can be closed off from the rest of the library’s services, he added. The city has three other warming centres – one at the Quinte Sports and Wellness Centre, one at the library and one at the Salvation Army’s downtown headquarters – but none of them permit overnight stays. The new centre solves that problem. The plan for the new overnight centre was originally that it stay available until March 31. But at Monday’s meeting, Coun. Bill Sandison put forward a motion to extend the closing date to April 10. Extreme cold doesn’t always end in March, Sandison said. His motion was approved by the rest of council. The daytime warming centre at the library will not be affected by the new overnight centre, Panciuk said. The centre will be open from 8 p.m. to 8 a.m. on nights when temperatures fall to -15 C before windchill and to -20 C after windchill, according to city officials. The decision on whether to open the centre on any given night will be made by Belleville fire chief Mark MacDonald, head of the city’s emergency services. There will be security guards in the library building overnight when the centre is in operation. As the warming centre will not function as a homeless shelter, no meals or cots will be provided. Residents will be notified of the centre being open through the city’s social-media accounts, the local media and community organizations.